The dreaded Pinktober Pinkout Pinktacular is almost here, and NFL Shop already is emailing the ladies telling us to buy pink, pink, pink. But there's a good chance football fans will see less pink this time around, according to Uni Watch. The site's founder, Paul Lukas, reports that the league will have less pink this October, with no pink used for nationally televised games—which would make this coming Sunday the season debut. Why the shift away from the Pinktravaganza? Good question. The NFL did not respond to our request for comment. 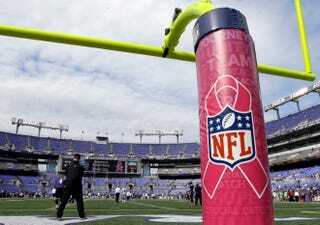 The NFL has taken a lot of heat over questions of just what percentage of every dollar spent on pink merchandise is actually going to cancer research, and over the effectiveness of the league's "Crucial Catch" awareness program. And of course there's the looming cloud of the league's piss-poor handling of domestic violence issues. Lukas describes his source as a "buyer for a well-known chain of sporting goods stores" with whom he participated in a panel discussion a few weeks back as part of an NYU sports business class. The NFL will be dialing back the throttle a bit this year on Pinktober. This has nothing to do with the recent domestic violence issues that have been in the news—Mr. Buyer said the league had already planned to soft-pedal the pink months ago. There'll still be some pink, but not as much. But some of the unpinking is beyond the league's control. A day after Lukas' report, manufacturer Procter & Gamble pulled out of a partnership with the NFL for Breast Cancer Awareness Week because of all the NFL's off-field woes. Whereas players from each team were to wear pink Crest toothpaste-branded mouthguards, they now will merely be given the option. But don't get too excited about a reprieve from the Pinkocalypse. The NFL hasn't given up on the idea of swathing its games in some color or pattern to show support for a random cause. Because there is still PR to be had. On the other hand, Mr. Buyer said the NFL plans a bigger push this year for G.I. Joevember. He didn't specify what the bigger push would involve, but it can't be good. So, G.I. Joevember it is. Of course, none of this means the end of Pinktober. The NFL might turn down the pink, but its leaders certainly doesn't want me to stop buying it. I got this email today.